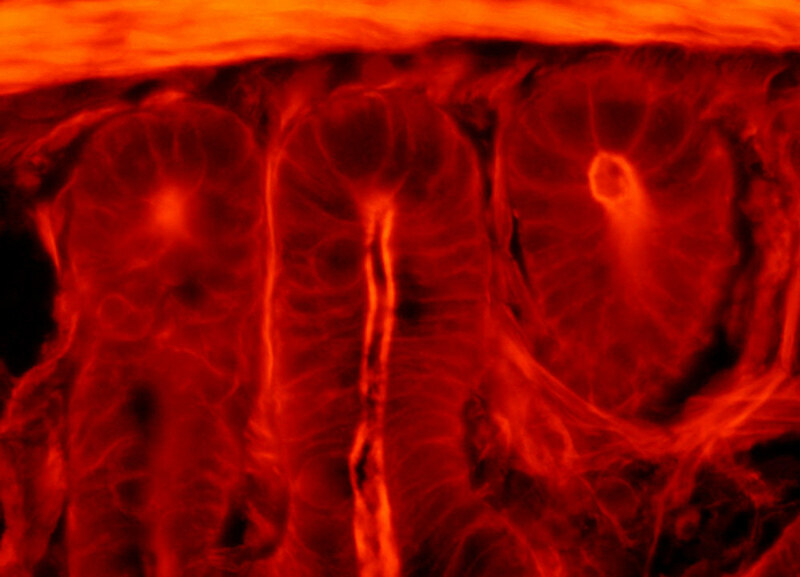 Fluorescence emission intensity from a thin section of mouse intestine stained with Alexa Fluor 350 wheat germ agglutinin, a blue fluorescent lectin that is specific to the mucus of goblet cells. In addition, the specimen was simultaneously stained with Alexa Fluor 568 phalloidin (filamentous actin; 600 nanometer emission) and SYTOX Green (nuclei; 504 nanometer excitation and 523 nanometer emission). Note the low level of background noise in comparison to the Nikon longpass filter combinations (G-2A and G-2B), and the significant amount of yellow-red signal arising from Alexa Fluor 568 that appears in the image.